The Wunderwagon -HC I.V. Trailer allows a wheeled I.V. pole to be safely transported behind a Wunderwagon -HC. This optional kit affords children with infusion pumps or other types of I.V. equipment mounted to a wheeled I.V. pole, the freedom to leave their room while maintaining the necessary care. Parents and hospital staff no longer have to drag the cumbersome I.V. pole along with the wagon. This increased mobility gives children a psychological boost that contributes to the healing process. 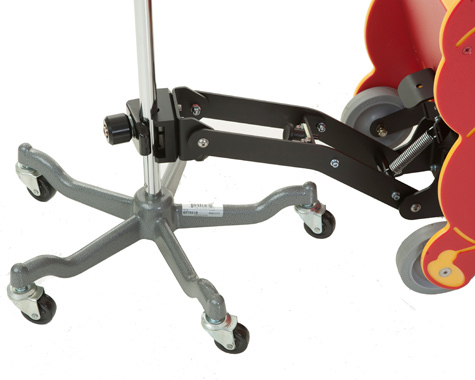 The Wunderwagon -HC IV Trailer includes a heavy-duty mechanism for attaching a wheeled I.V. pole, without the use of tools, to a Wunderwagon -HC. The I.V. Trailer comes fully assembled.